CANNES — Brutal military repression looks the same everywhere and Francisco Vargas’ striking and poetic film “The Violin” in Un Certain Regard offers a plaintive cry on behalf of the oppressed. 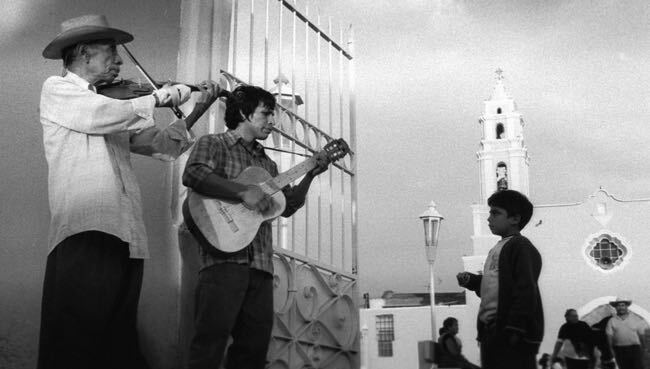 Shot in richly textured black-and-white with an eye for classical framing, the film relates a simple tale of a small group of Mexican peasants thrown off their land for resisting the government’s heavy boots. Among them are three generations of farmers and musicians. Genaro (Gerardo Taracena) is the local guerilla leader who leaves his son Lucio (Mario Garibaldi) with his aged father Don Plutarco (Angel Tavira) as he plans armed resistance. The small group’s ammunition, however, is buried on the land they have left behind. Plutarco, who is missing his right hand but still plays the violin, decides to go home to see what he can do. By charming the capting in charge (Dagoberto Gama) with his violin playing, he is allowed to tend to his crops, which allows him to smuggle out some much-needed bullets. The captain and the old man play a wily game as the days go by and the tension builds steadily as Plutarco takes greater risks to arm his son and his companions. Vargas’s screenplay includes some memorable lines that speak to the struggle of the poor and the power of their oppressors. Tavira, a lifelong musician who lost his right hand in an accident when he was 13, brings gravitas and humor to the role of an ancient who knows the struggle is eternal. This entry was posted in Festival de Cannes, Film, Music, Reviews and tagged 'El Violin', Angel Tavira, Festival de Cannes, Francisco Vargas, Memento Films, Un Certain Regard. Bookmark the permalink.